Waffles are a pretty awesome breakfast anytime staple for us. Before we changed our diet, we would eat Eggo or Kashi waffles every morning. I remember walking to campus munching on a toasted waffle, or a waffle and peanut butter sandwich. Once we started cutting out processed foods, we started to make them in huge batches on the weekends, and freezing them to pop in the toaster during the week. In the summer I would throw in strawberries or blueberries, and in the winter nutmeg or pumpkin. 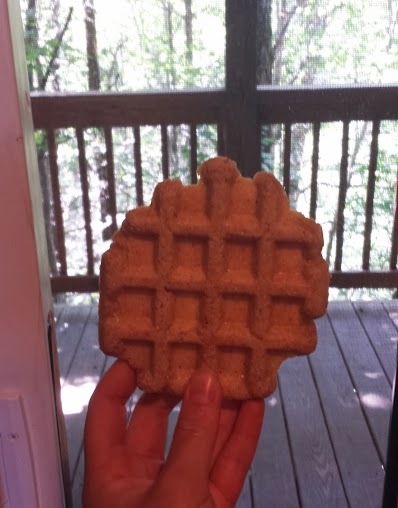 When we went [more] gluten free, it took some time for me to find a waffle recipe that would stand up well to freezing, and actually taste…waffle like. I found this one earlier in the year, and really enjoyed it. The only problem seemed to be the oats. It took me a while to realize it, but they made me feel just as poorly as gluten [a common cross intolerance]. So, oats were out, and for a while it seemed waffles were too. I tried a bunch of recipes, but the oats played such a crucial role in absorbing liquid and giving the waffles ‘fluff’ that nothing else seemed to do. They are were delicious, even with the over abundance of nutmeg. The batter thickened as I stirred it, and I knew they’d be perfect. When I opened the waffle iron I screamed ‘OH MY GOSH’ and Nathan came running in to see what was wrong. I just kept pointing to the waffles saying ‘they’re perfect’. And the taste – light, fluffy middle with just a slightly crispy shell. I have found my new waffle recipe. I am content. I am making these for supper tonight. But, I am fixing a double batch because I want some to freeze for a quick breakfast in the mornings. Last time I made these waffles they were gone in no time flat! Pingback: Creamy Tomato Soup and Waffles [Vegan/Gluten Free] | Make them whole foods. Make them delicious. And make sure you feel great eating them.